Better enables students to learn challenging material through effective, efficient examples and explanations. 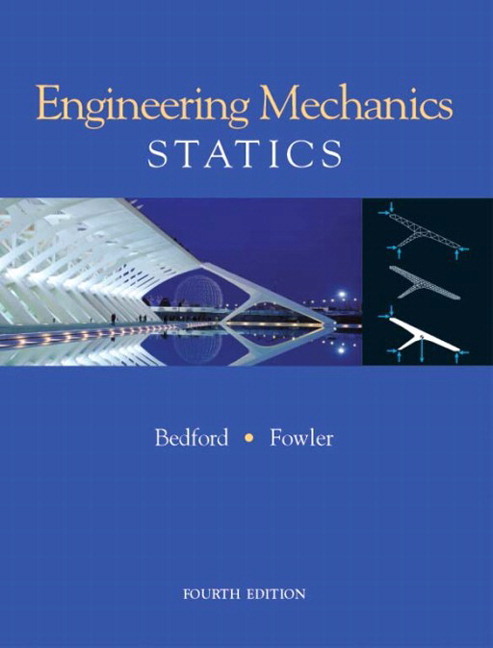 Bedford and Fowler developed their Fifth Editions of Engineering Mechanics: Statics and Dynamics to answer the question: How can textbooks be restructured to help students learn mechanics more effectively and efficiently? Active Example - A new example format that encourages students to spend more time thinking critically about the concepts. Each section contains an Active Example that is presented in a format that integrates the text and art. A Practice Problem is included within each Active Example to allow students to check their understanding. To give students additional motivation to check their understanding, the answer and full solution to the Practice Problem are included in the back of the book. Example-focused Problems - Homework problems designed to encourage students to return to a previous example in the section and study it to expand their understanding of the concept. Professors can easily identify and assign these problems to encourage further study of particular examples. Results — Subsections that present essential contents of each section. Photorealistic Art Program — Illustrations have been specially rendered to offer photographic—almost 3D—quality. Helps students connect visually to engineering situations. Triple Accuracy Checking—Every page of the book and solutions manual has been reviewed by three checkers to guarantee accuracy. Results – Subsections that present essential contents of each section. 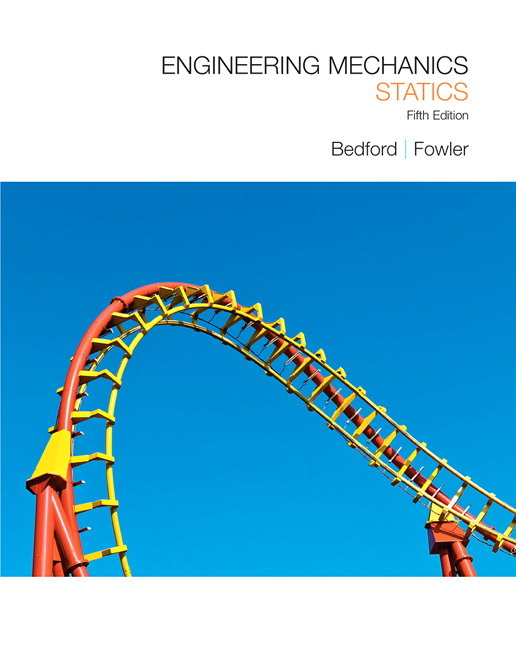 Engineering and Mechanics. Learning Mechanics. Fundamental Concepts. Units. Newtonian Gravitation. Vector Operations and Definitions. Scalars and Vectors. Rules for Manipulating Vectors. Cartesian Components. Components in Two Dimensions. Components in Three Dimensions. Products of Vectors. Dot Products. Cross Products. Mixed Triple Products. Types of Forces. Equilibrium and Free-Body Diagrams. Two-Dimensional Force Systems. Three-Dimensional Force Systems. 4. Systems of Forces and Moments. Two-Dimensional Description of the Moment. The Moment Vector. Moment of a Force About a Line. Couples. Equivalent Systems. Representing Systems by Equivalent Systems. The Equilibrium Equations. Two-Dimensional Applications. Statically Indeterminate Objects. Three-Dimensional Applications. Two-Force and Three-Force. Trusses. The Method of Joints. The Method of Sections. Space Trusses. Frames and Machines. 7. Centroids and Centers of Mass 316. Centroids. Centroids of Areas. Centroids of Composite Areas. Distributed Loads. Centroids of Volumes and Lines. The Pappus-Guldinus Theorems. Centers of Mass. Definition of the Center of Mass. Centers of Mass of Objects. Centers of Mass of Composite Objects. Areas. Definitions. Parallel-Axis Theorems. Rotated and Principal Axes. Masses. Simple Objects. Parallel-Axis Theorem. Theory of Dry Friction. Applications. 10. Internal Forces and Moments. Beams. Axial Force, Shear Force, and Bending Moment. Shear Force and Bending Moment Diagrams. Relations Between Distributed Load, Shear Force, and Bending Moment. Cables. Loads Distributed Uniformly Along Straight Lines. Loads Distributed Uniformly Along Cables. Discrete Loads. Liquids and Gasses. Pressure and the Center of Pressure. Pressure in a Stationary Liquid. 11. Virtual Work and Potential Energy. Review of Mathematics. Algebra. Trigonometry. Derivatives. Integrals. Taylor Series. Vector Analysis. Properties of Areas and Lines. Areas. Lines. Properties of Volumes and Homogeneous Objects.